A $9 computer created in California, does everything any average family PC is supposed to do including surfing, programming and entertainment. The tiny gadget has raised more than $1.5 million on Kickstarter – 30 times more than its developers asked for. The computer is called CHIP and it fits in a breast pocket, while being a full-featured mainline Linux computer without any reservations. With a 1 GHz processor, 512Mb of RAM and four gigabytes of solid-state memory drive, it performs most of the tasks needed for work in office or back at home – at least that’s what the developers say in a promising Kickstarter bid. 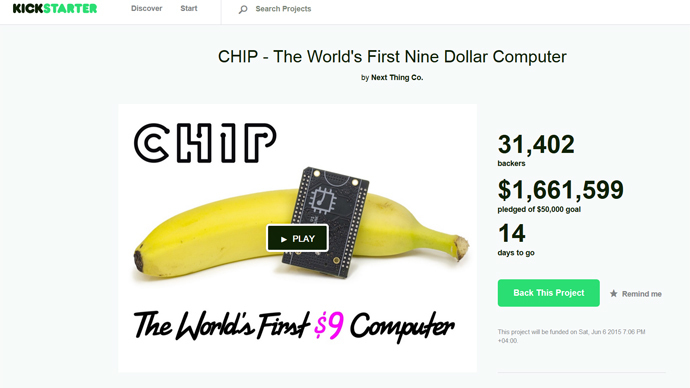 Demanding $US 50,000 at Kickstarter, CHIP group has already raised $1,661,687 from 31,404 backers (as of 1:00 PM GMT on Saturday). What one needs to get the device going is any screen, old or new, not essentially a computer monitor, any keyboard and a mouse. CHIP has an interface that would look familiar to most computer users: It has Wi-Fi and Bluetooth modules and is ready for web-surfing with a pre-installed browser. The MIDI interface can also get your music collection rocking when connected to powered speakers. It could even become a widely used portable computer with Pocket CHIP with a 4.3” touchscreen, QWERTY keyboard, and 5-hour battery life. However, that would cost additional $40. CHIP is being advertised as a “totally open source” which comes with dozens of most-needed pre-installed apps, tools and games with “thousands of free applications from the open source community” to follow. There are other similar ultra-cheap computers already in existence, such as Aakash 2 or Raspberry Pi. But CHIP is way lower in price and claims to trump the competitors in effectiveness and adaptation for personal needs. There is little wonder about the enthusiasm of the donors, as having a computer worth very little and able to perform basic tasks is very appealing. “If someone wants the highest end computer in terms of quality and design – they are going to go for an Apple product,” Brad Jones, tech reviewer and contributor of MAKEUSEOF Youtube channel told RT. “Yet when someone wants something much more cost-effective and practical to get the job done – his choice would be something similar to C.H.I.P. and such computers would become very much popular with people who need a “computer for computing,” Jones predicted. Such giants as Microsoft and Apple are, according to the expert, soon likely to realize the advantages of this scheme and they might try to straddle the trend by making software of their own for such machines.